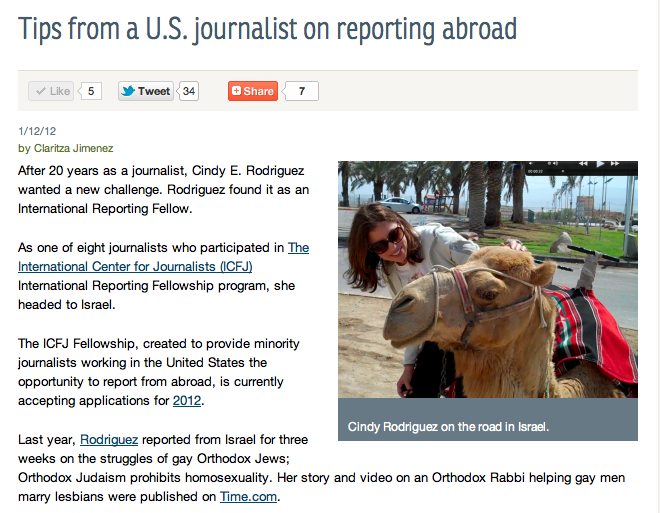 The International Center For Journalism’s Claritza Jiménez interviewed me for a Q&A on how I prepared to report overseas for my ICFJ International Reporting Fellowship. It was published on IJNet.org, the International Journalists’ Network. How did you identify a reporting topic? CR: The reason I was interested in this topic goes back to the general issue of how people are marginalized in society and especially in the context of religion. I wrote my Master’s thesis on this subject and had just finished at Columbia University [Graduate School of Journalism] in 2010. So, this topic was still fresh in my mind and something I wanted to delve into a little bit more. What was it like reporting overseas as a freelancer? CR: I didn’t have an editor to crack the whip and just bounce ideas off of and to frame ideas. So, I relied on some friends, but they’re not getting paid and there’s only so much time you can take from them. So, that was tough. I didn’t have someone to talk to help develop the story. You can read the full Q&A here at IJNET. Next Post Oh, was there a game on?